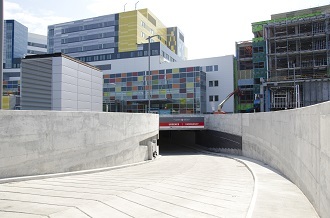 The underground parking lot is located below the main plaza at the MUHC Glen site. There is space for 1,582 cars (including 28 handicapped spaces). The maximum fee payable is $24/day for a 24-hour period in the underground parking lot. The Express Parking lot is located on the main plaza at the Glen site, directly across from the main entrance to the hospital. There is space for 40 cars. See below for rates. Turn into the Glen site from Decarie Blvd. and follow the roadway in front of the hospital. Option 1: turn left at the red “URGENCE/EMERGENCY” sign which is directly across from the main entrance of the Montreal Children’s Hospital. Follow the circular driveway down to the underground parking lot. You can stop in front of the MCH Emergency entrance to drop off passengers. Continue a few more metres: a gate entrance to the parking lot is on your left. Enter the parking lot here. Option 2: Follow the roadway in front of the hospital until you reach the STOP sign at the end. Turn left, then immediately turn left again, following the ramp down to the underground parking lot. Display boards provide up-to-the-minute information on the number of available parking spaces on each parking level (P1-P4). Level P2 in front of the elevators that lead up to the hospital. The Parking Desk (A.RC.1000) in the Larry and Cookie Rossy Promenade accepts Visa, MasterCard, and payment by Interac. You can also pay for daily parking rates by credit card (Visa or MasterCard) at the exit gate when you leave the parking lot.